May 18, 2012 July 17, 2018 - 7 Comments. Socorro, New Mexico is a dichotomous town. It is the second oldest inhabited community in our culturally blessed Land of Enchantment, yet it boasts one of the nation’s premier research universities. It is steeped in history and tradition, inextricably linked to its storied past while embracing the technologies which are laying the groundwork for future peace and prosperity. Socorro, it seems, is also a “jumping off” point to other destinations. It is within minutes of the Bosque del Apache National Life Refuge where 12,900 acres of boggy bottomlands host tens of thousands of ducks, Canadian geese and Sandhill cranes, transient visitors which make their annual trek to this winter habitat. It is scant miles away from the Trinity Site where the first atomic bomb was detonated in 1945. If culinary tarriance is what you seek in your sojourns throughout the Land of Enchantment, Socorro probably isn’t at the top (or perhaps anywhere near) of your list. In fact, among some savvy southbound foodies, Socorro is just the town you pass on your way to San Antonio, home of the world-famous Owl Cafe, the becoming just as famous Manny’s Buckhorn Tavern and the deserving of fame San Antonio General Store. One restaurant is slowly changing that perception. The Socorro Springs Brewing Company is quickly establishing a reputation as a destination restaurant, a reason to get off I25 and pause for a good meal. It is a rarity in a town facing the incursion of corporate chains and the aging of hometown restaurants in timeworn edifices. It is a multihued swath of color in a monochrome town. The Socorro Springs Brewing Company just may be the town’s version of Cheers, a pub and restaurant all the locals visit and ostensibly, a local tavern in which everyone knows your name. Get there on a Friday or Saturday night and you just may have to wait for a seat to come open. Most of the cars in the parking lot bear New Mexico, U.S.A. license plates, but you’ll also espy plates from other states not nearly as enchanting. The walls in the back dining room are festooned with amazing framed prints taken at El Bosque del Apache. There’s something remarkably calming about being backdropped by the imagery of majestic birds in flight and at play in one of the state’s natural treasures. The cynosure of the main dining room is the large wood-fire oven fired with pecan wood grown in the Rio Grande Valley. Pecan is a very clean and hot burning wood that imparts a slightly sweet and nutty flavor that you’ll be able to discern on the pizza. The Socorro Springs Brewing Company is a full service restaurant with an on-the-premises brewery whose ales and lagers have earned accolades and awards from aficionados of adult beverages. If your tastes in beer lean toward sarsaparilla, you’ll love the home brewed root beer. It’s an adult root beer–not too sweet or acidic with a nice herbal bouquet. It’s a better root beer than you’ll find at Albuquerque’s Il Vicino restaurant which also brews its own. It may even be better than the root beer at Rio Rancho’s Turtle Mountain Brewing Company. Don’t just take my word for it. Read what Luke’s Root Beer reviews have to say. The menu is surprisingly sophisticated with entrees ranging from wood-fired gourmet pizza or calzones to hand-cut rib eye steaks grilled over a 100 percent pecan wood-fired grill. The restaurant’s mission is to offer the absolute best dining experience at an affordable price in a casual yet classy environment. Mission accomplished! The menu offers nightly specials and scratch-made soups of the week. The soup might be mulligatawny, the special grilled mahi mahi. There’s a lot of variety and creativity on the menu. Ingredients are of surprisingly high quality. All the restaurant’s beef is from the Buena Vista Ranch in northern New Mexico. All ground beef is 100 percent top round. The New York strip and Ribeye are 100 percent USDA choice or higher. An early indication that the kitchen staff knows what it’s doing is how good the fresh made salsa with fire-roasted jalapeños is. It’s a fresh salsa of medium piquancy and maximum flavor, a surprisingly good salsa with the invigoratingly fresh flavor combination of chopped tomatoes, onions, cilantro and fire-roasted jalapeños. It’s served with yellow, blue and red corn tortilla chips which are lightly salted, crisp and formidable enough not to crumble under the weight of large salsa scoops. Hawaiian Pizza: Marinara, mozzarella, pineapple and prosciutto ham. 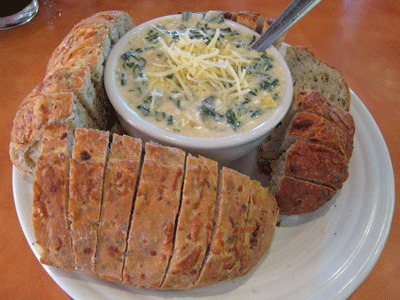 Another excellent appetizer is the Spinach and Artichoke Dip made with a quadrumvirate of queso–four delicious cheeses: Parmesan, Feta, Brie and Cheddar-Jack as well as fresh spinach and artichokes served with a toasted Cheddar batard (a torpedo-shaped loaf of bread that is thicker and stubbier than a baguette) loaf. The dip is thick and creamy, served at molten warmth. The four cheese combination has a lot of personality and flavor complemented very well by the ever so slightly toasted Cheddar bread which is sliced thinly. Wood-fired pizzas are, according to the wait staff, the most popular draw at the restaurant. It’s easy to see why. These are hand-tossed ten-inch round pizzas made with homemade dough, sauces and gourmet toppings all baked in a pecan wood-fired brick oven until “kissed by the fire.” You may want to kiss the pizza chef by the time you’re done with one of these beauties. Just listen to the ingredients on the “El Cerdo” (translated to English as “the pig”): red chile marinated pork loin thinly sliced with locally grown red chile sauce, capicolla ham, Cheddar-Jack cheese, Roma tomatoes, scallions and black olives topped with fresh cilantro. It’s every bit as terrific as it sounds and is on par with the gourmet pizzas served at Rio Rancho’s Turtle Mountain Brewery (and better than any pizza at the aforementioned Il Vicino). It’s even good cold. 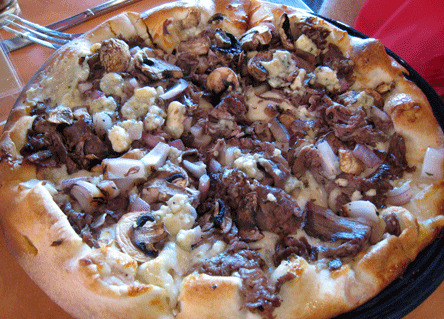 Also quite good is the auspiciously named Black and Blue pizza, a pie crafted with olive oil, roasted garlic, mozzarella and bleu cheese, grilled onions, mushrooms and thin sliced steak. That’s quite an ingredient line-up for quite a pizza. The spelling “bleu cheese” as opposed to “blue cheese” denotes little in terms of the actual cheese because “bleu” is simply the French spelling of “blue,” but attitudinally, it says a lot. It says Socorro Springs wants patrons to know they’re not getting some cheap, watery salad cream quality blue cheese. It makes a difference. The other ingredient stand-outs are the thinly sliced steak, kissed with just a hint of pecan-wood smoke. Wood-Oven Lasagna (Layers of spinach, egg pasta, roasted red bell peppers, red onions, mushrooms, Canino’s Italian sausage, roasted garlic, marinara, ricotta and mozzarella. Finished with basil-pesto. 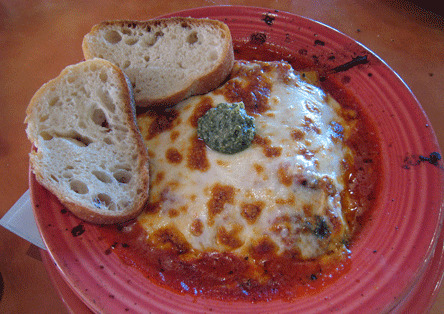 It’s not often you’ll find restaurants serving wood-oven lasagna so ordering it is a no-brainer for adventurous diners. Socorro Springs rendition is made with layers of spinach, egg pasta, roasted red bell peppers, red onions, mushrooms, Canino’s Italian sausage, roasted garlic, marinara, ricotta and mozzarella topped with just a smear of basil-pesto. Served the temperature of molten lava, your first impression might be of wispy steam wafting upwards or it might be of the roof of your mouth being scalded by the molten cheeses. Let it cool off enough and you’ll be rewarded with a surprisingly good lasagna. There is one item on the Socorro Springs menu which hasn’t win me over. Surprisingly it’s the restaurant’s version of a green chile cheeseburger, a beefy behemoth named the World-Famous Burger. A half-pound patty of lean ground beef is impregnated with New Mexico green chile then grilled on the restaurant’s pecan wood-fired grill and topped with your choice of cheese, lettuce, tomatoes, red onions and pickles. The green chile has a nice roasted flavor though it’s a bit on the mild side. The ingredients are of high quality. Alas, the pecan wood influence is a strong one, imparting an off-putting ashy flavor that pretty much overwhelms the entire burger. Barbecue purists recognize that a little smoke goes a long way. It’s a lesson which should be applied to this burger, too. One special which just might make it onto the daily menu is the Penne Pasta Arrabiata, a word which means “angry style” due to the heat of the peppers with which it’s made. This pasta dish is comprised of a garlic, tomato, basil and red chile sauce cooked in olive oil. If the red chile isn’t enough for you, a small cup of red pepper flakes comes with it. The restaurant’s rendition also includes a spicy Italian sausage and heady olives. The highlight of this entree is the sausage, as good an Italian sausage as you can find in New Mexico. “As good as you can find in New Mexico.” That seems to describe several items on the menu. 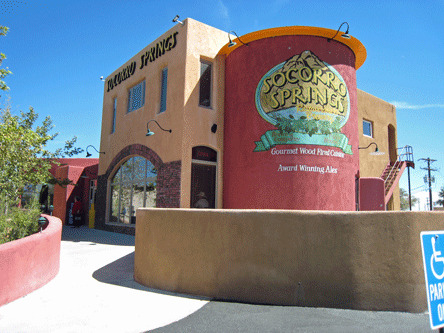 It’s no wonder the Socorro Springs Brewery is starting to be mentioned alongside some of the area’s famous restaurants. It’s another reason to visit the great small city of Socorro. FYI, they no longer brew beer on the premises — it is brewed in Colorado and transported down to the restaurant. Calling it a “brewery” may be overstating the situation. They also will not fill up a growler with their beer. Ate here in October of 2010 and loved the red chile marinated pork. Went again yesterday and found it was removed from the menu. According to our server, it was too time consuming to make. I ended up with a club sandwich with grilled chicken and a side of potato wedges. This was really good but I can’t believe they did away with the pork. Among the items we like most are the Southwest Cuban sandwich (red chile marinated pork plus veggies and cheese), the soups—especially the asparagus soup, the Conquistador Calzone (3 cheeses, pepperoni, prosciutto roasted red pepper and always piquant green chile) and the Elfego Pizza (pepperoni and green chile). Although I point these items out, we have always been happy with what we have been served including pasta dishes and salads. I also had a great house-brewed Dutch lager on a recent visit. And, oh yes, they make a great root beer. Whatever the case, you could really taste the smokey wood in the burger! More so than any other burger I’ve tried before. Almost too much. My dining partner had the pesto calzone and it was a plate-cleaner. They probably didn’t have to wash that plate before using it to serve another customer. Did I mention they have great beer? Talk to you soon, bud!! I love that there is now a comments section to your site, compadre! I love this place. We head there every once in a while just to escape the rat race. The drive isn’t bad and is rather relaxing and Socorro’s laid-back landscape makes us feel like we’ve had a mini-vacation. But the draw for me is the chile-rubbed Cubano (it’s always the Cubano, isn’t it?) It’s probably as authentic as a cowboy wearing pink boots, but it’s much more tasteful. I really like that sandwich. I wash it down with one (or three) of their fantastic microbrews. I can’t remember my favorite right now, but I recognize it on the menu when I see it…I think it’s a red.